Lights out! Doors locked! Very big bat at the ready! Whatever you do, do NOT watch this in a cabin in the woods and do NOT watch it alone. You'll never sleep again. Shot in 16mm, "Blair Witch" will translate extremely well to the small screen because there's nothing lost on the edges. To quote Dan Aykroyd in the "Twilight Zone" movie: "You wanna see something really scary?" I'm not talking about the jump you get from cats leaping out of cupboards in "boo!" movies. I'm not talking about Freddy, Jason or Michael. I'm not talking about kitchen-knife slashers, killer dolls or pop culture-savvy sweater girls with their guts spilling out. That's kids' stuff. That's the kind of movie you see when you want your date to jump in your lap. 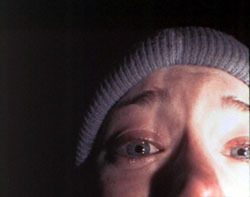 "The Blair Witch Project" isn't designed to make you jump. It isn't designed to gross you out. "The Blair Witch Project" is designed to make you fidget, then make you panic, then make you lose a night's sleep because you can't shake the psychosomatic sensation of being scared out of your wits. "The Blair Witch Project" is scary because -- unlike factory-produced horror movies -- it seems so real. Snatched up at Sundance after frightening the bejesus out of cynical, upper crust, Hollywood types, "Blair Witch" purports to be the found footage of a film school documentary crew that disappeared in the Maryland wilderness in 1994 while making a non-fiction film about local witchcraft and serial killer lore. Shot on video and 16mm film, it has a disturbingly home movie feel, as the footage pieces together the last few days of three young filmmakers who get lost in the woods and begin to unravel and turn on each other as they're stalked by seemingly supernatural forces. Starting off light and humorous, the picture introduces us to ambitious film student Heather Donahue, cameraman Josh Leonard and soundman Michael Williams (to heighten realism, the actors' names are the characters' names) as they pal around while interviewing locals about the portentous legends of children's murders and hauntings over the centuries. But when they become lost, their nights are spent huddled in a small tent while horrible noises -- footsteps, screams and moans that are maddeningly hard to make out on their sound equipment -- surround them. Each morning they wake up to find evidence that someone or something had been inside their camp. Each day they try and fail to find their car, or even a road. Then on the fifth morning two of them wake up to find the third missing. The following night, more lost than ever, its his screams they hear in the cold forest ethers. Because of Heather's egocentric determination to capture every moment of her project, at least one of the cameras is always on -- held by Heather, Josh or both -- capturing every moment, every emotion of their hungry, hunted nightmare. The concoction of writers-directors-editors Daniel Myrick and Eduardo Sanchez, "The Blair Witch Project" is a wildly creative experiment in human nature. Following more of an outline than a script, their actors are not asked to pretend, they're made to believe as terrifying scenes take shape for the first time before your eyes. Leonard, Williams and especially Donahue have submerged themselves in their characters' circumstances. They're cold, they're lost, they're angry, they're scared. But Heather insists the cameras keep rolling, holding the audience rapt in incredible tension. While it achieves the exact, Pavlovian audience reaction it's going for, earning what would be a four star review for creativity and undeniable realism, "The Blair Witch Project" loses a point because the characters are lacking a reasonable amount of common sense -- the movie's single, unavoidable flaw. They're not experienced outdoorsmen. Neither am I. But I know enough -- even in a panic -- to follow the stream bed they come back to again and again, to use the lights on their cameras to light their way and keep moving at night, or if I did stop, to light a couple really big fires and stay between them. Not that any of this would do a bit of good against whatever it is that haunts the woods in "Blair Witch," but at least they wouldn't have been sitting ducks, as Heather, Josh and Michael are for large parts of this movie. Still, this film is scary on a whole new scale. It's not just exponentially terrifying, but unsettling and disturbing because it doesn't feel like fiction for even a second.